Well, I broke down and purchased a pair of Saucony Kinvara 2’s. My original pair are still in pretty decent shape, despite having run two marathons and ~200 miles on them (I don’t tend to accumulate a lot of miles on individual shoes given all of the reviews I do – these have the most of any in my current rotation). However, I figured I’d get a pair of the sequel and stick it in the closet until the first pair officially give out. I haven’t run in the Kinvara 2 yet (I want to keep them in reserve), but from just trying them on, the feel is pretty much the same as the original. In fact, the Kinvara 2 is little changed from the Kinvara 1. Therefore, my goal in this post is simply to provide some photos of the Kinvara 2 and highlight some of the changes. The first thing to note in the Kinvara 2 is that the outer layer of fabric on the upper seems to be a bit different – it’s hard to say for sure since I’m comparing to a well-used pair of 1’s, but the material feels a bit more “plasticy” and more durable than that on the Kinvara 1. This could help with forefoot tearing issues some people have had with the upper on the original Kinvara. Internally, the Kinvara 2 has a new layer of mesh that was not present in the Kinvara 1. This is easily seen in the comparison images below, and should help keep dust and small debris out (personally have not had much problem with this). It might also help with sockless running comfort. As for the sole, the basic construction and feel seem to be very similar between the two models, and the 4mm drop (without the insole) appears to be the same based on my measurements. I forgot how squishy the sole is in a new pair of Kinvaras, and based on the difference in feel between this and my old pair, it seems apparent that this changes with use. When looking at the two shoes side by side, it does seem as if the sole of my original Kinvara is wider than that of the Kinvara 2 (see photos below). Measuring across the forefoot in the same spot on both shoes, I get 117.2 mm for Kinvara 1 and 109.7 mm for Kinvara 2. For the heel, I get 90.7 mm for Kinvara 1 and 86.2 mm for Kinvara 2. In a post from a few months ago, the Running Warehouse blog stated that “The midsole, outsole, heel drop, all the good things that people have come to love about the current Kinvara remain unchanged” in the Kinvara 2. If this is the case, then the increased width of the sole in my old pair must be due to midsole compression that has flattened and widened the EVA (incidentally, here’s a cool post on EVA breakdown from the UVA Speed Clinic). The pictures below demonstrate differences in the soles quite well. Would be interesting to measure a fresh pair of the original Kinvara and see if they match up better. Finally, my Kinvara 2’s weigh in at 8.1 oz in size 10. 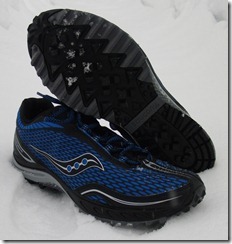 In summary, the Kinvara 2 is mostly a cosmetic update with a few added features in the upper. As I said at the beginning of this post, I have not run in the Kinvara 2 yet, but given the lack of major differences, I expect performance would be the same (you can read my review of the original Saucony Kinvara here). I’d still like to see Saucony widen the forefoot just a tad and add some rubber under the lateral forefoot for those who scuff this area, but all in all I’m glad that they didn’t change much in what has been one of my favorite shoes. 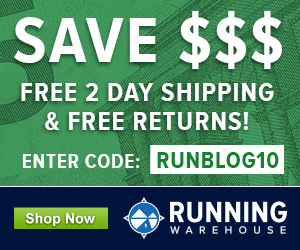 The Kinvara 2 is available at Running Warehouse (click banner at bottom of post), and can also be purchased for 20% off + free shipping (until May 31) from Shoes.com. Comparison of soles from the Kinvara 2 (left) and Kinvara 1 (right). 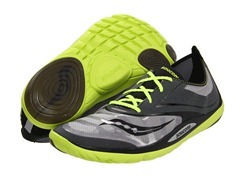 Note the increased sole width in the Kinvara 1. Note the respectable condition of the Kinvara 1 sole after 200 miles – I started running in these before transitioning my gait, so there is some heel wear, but I used to chew through heel outsoles by 200 miles. Because the Kinvara is so cushy, I’m sure I still do heel strike in them frequently when not concentrating on gait. Sole wear is mainly due to friction, and my feet tend to be moving backward by the time I land, so I see much less wear overall in all of my shoes than I used to. Comparison of soles from the Kinvara 2 (bottom) and Kinvara 1 (top). Note the increased sole width in the Kinvara 1. Comparison of soles from the Kinvara 2 (top) and Kinvara 1 (bottom). Note the increased sole width in the Kinvara 1. I just got the new Kinvara 2s and can corroborate everything mentioned in this post. I’ve run 400 miles in my Kinvara 1s, and mine look very similar to those in the pics above. The Kinvara 2’s sole width is a lot narrower than my Kinvara 1’s, but it may be due to the mileage and EVA breakdown. Just eyeballing the top of the toebox width on both, however, I think they are identical in width. Although I have wider feet, I notice no difference in the width or tightness of the upper around my mid and forefoot between Kinvara 1 and Kinvara 2. I ran 10 miles on friday, then 20 miles on saturday in the Kinvara 2’s and appreciated the fresh shoes. My legs felt great after both runs. I ran a fair amount of these miles on packed and groomed trails, and got no pebbles or anything in my shoes. Perhaps the different mesh is doing it’s job? I did notice that my pair of Kinvara 2s weigh .3 oz. more per shoe than my Kinvara 1’s (same size). Perhaps my shoes have lost weight over the 400 miles I’ve run in them? Hi, I’m a huge Kinvara fan and have gone through 3 pairs of the Kinvara 1. I run ultras so I go through shoes very quickly. Until the Kinvara 1 came out, I struggled with toe nail blisters to the extreme for many years. This would only occur in the 50k on up distances. The Kinvara 1 solved this and I have had minimal problems. In fact, I ran Umstead 100 last month in a new pair of Kinvara 1 and only had one little blister on the side of my toe (which I can even get from a marathon). Furthermore, I have done some fairly technical (not muddy) trail events in them instead of wearing my trail shoes and they are great. I bought my 4th pair of Kinvaras, the 2, and was very disappointed. They feel more like a regular rode shoe (except still light weight) and are tighter in the toe box. As someone who has a wide forefoot, this is a problem. My toes do not feel as free to move and I’m quite sure that I will have toe blister issues in ultras again as a result. The Kinvara 1s did tear slightly but I don’t wear them long enough for it to make a difference or concern me. I was able to get a new pair of Kinvara 1 that I will save for ultra distance events only. I purchased this exact color of Kinvara 2 about 2 weeks ago and they have sat in my closet, as I have (like you) the originals with about 200 miles in them waiting for a “blowout” – did virtually the same comparison you did without taking pictures – so reading this post is kinda funny. However, I did not do a sole-width comparison, so I am interested in checking that out. Not sure what you weigh – but I check in at about 155lbs, so will see if there is any real difference; if weight of the runner matters. I am now inspired to run in them… so I will probably take a spin tomorrow. Thanks, Pete! I’m about 169 right now, so a bit heavier. Still have not done a side x side comparison of the soles – I have the K2s at work and K1s at home right now. I have run about 15 miles in the K2s this week and I can honestly say that I don’t feel any real difference other than the K2s just feel fresh or new and not broken down. They will continue to be my go-to shoes for most of my training and races over 10K. Thanks, Pete! although I am terribly late, I figured I should still finish what I said I would. I measured my K1s to my K2s and the sole of the K1 is about 1/8in wider than the K2… for whatever it is worth. I feel like it had to be more than just compression, but who knows! I bought a pair of these a few weeks ago and they feel great. I’ve been running in Brooks Launch and Mizuno Elixirs for most of my runs. After running in the Kinvara 2’s and doing a half-marathon in them I am experiencing some achilles and calf pain. I am attributing this to the difference in the heel to toe ratio. Any thoughts? I’ve thought about limiting the miles on these shoes to shorter runs until I build up to them. I’ve experienced the same thing with the NB Minimus Trail shoes but I don’t do any long distances in them so it has not been as severe. to take some time to adjust. Would explain the calf soreness. The width of the toe box is my only complaint with Kinvaras. If they were just a touch wider, pretty sure they would be my “hands down, go to” shoes. I was really hoping that the Kinvara 2 would fix that. 1st true barefoot run today. 2 miles on golf cart paths. felt surprisingly great, no blisters or blood. the part I liked most was (it was in the dark) that since I couldn’t see any trail debris, it forces you to run light on your feet and very springy. had a bit of a knee injury after overuse with the water shoes, but the natural stride correction with no shoes fixed that problem. will definitely go for another one soon, but not too soon. I read the information for this really good. It’s time I finally find a new pair of shoes! I am a Kinvara 1 lover – the only thing I would have changed is to make the toebox slightly wider, somethign I only really notice when I wear Injinji socks. Looks like Saucony may have gone the other way. NOOOOO!!!!!!!! Very informative post as always. FYI, I own 3 pairs of Kinvara 1s, one of which I still haven’t used yet. The other 2 are over 800 km and 250 km “old”, respectively. I was intrigued by what you wrote about midsole compression and by your pictures, so I decided to have a look at my 3 pairs and make some measurements of my own. Heel width (from oldest to freshest pair): 88 mm, 87 mm, 84 mm. Forefoot width: 112 mm, 109 mm, 107 mm. Pete, I think you are right about the breakdown of the EVA after 200 miles contributing to the difference in the width of your shoes. I have a new pair of Kinvara 1 that were still in the box and I compared it to the Kinvara 2 that I got last week and the widths look identical. Thanks for your thorough review, as always! Love my Kinvara 1’s. I am 6’4″ 202lbs and have 130 miles on mine. Should not have any issues getting them to 200-250. I am just glad they are offering some toned down colors for the new ones. My wife is always picking on me when I trot out the door in my flashy red soled shoes. I agree though, if the toebox was just slightly wider they would be a flawless shoe. Does anyone have experience running in Kinvaras in comparison to Lunaracers? also feel softer to me. Any plans on reviewing the Newton Distance Racers you did you 5k time trial in? Yeah, I should have one soon. I’ve run through two pairs of the Kinvara 1, with over 700 miles on each. Overall, I’m really happy with them, but I have a fairly wide forefoot, and I find the toebox a little tight. I do break through the uppers on the outside by my little toe after a while, and while I don’t care about the aesthetics of that at all, it does feel like indication that the toebox could be wider. It doesn’t sound like the Kinvara 2 toebox is notably different, which is a little too bad for me. I’m planning to try on the Altra Instinct alongside the Kinvara 2 and hopefully the Hattori. I just bought 2 pair of K2s. Also own 2 pair of K1s, one of which I have 300 miles on. Would agree that the K2s are slightly more narrow but it could be that they are less broken in. Also the lacing goes further toward the toe of the K2 than the K1. This is an improvement because as much as I like the K1 it always felt a little sloppy in the toe box. The K2 feels a little more put together – an extension of my foot. Kinvaras are great shoes for me and think I will like the K2 even more than the K1! The Kinvara’s felt really good on my feet, but i noticed i was having trouble keeping my typical pace, and ended up with much slower runs every time i wore the Kinvara’s. I usually wear Newtons or Asics racing flats. I assumed that the cushioning was too soft and didn’t give me a good toe-off. Anyone have similar findings??? Yes, I felt the same when I raced a road 10K a couple of weeks ago. I love Kinvaras 1 and ran a marathon in them. But, I am coming to the same conclusion that Kinvaras are too soft and do not translate my kicks into speed I need for faster races. I have enjoyed running in the K1s. I retired one pair after about 350 miles, have another in the 300+ mile range, and a third in the 60 mile range. Since I have fairly wide feet I have developed calluses on the outside of each foot in the past 3 months or so (I’m thinking it’s because of the K1s – before I ran in heavier shoes with wider toeboxes). I bought a pair of K2s without knowing they were narrower in the toebox. I definitely felt the difference in my first run in them today (14 miles) and will probably return them. Unfortunately, looks like I’ll have to switch to another shoe after I wear out my K1s. Any suggestions for shoes similar to the K1s that are wider in the toebox? Thanks! Maybe something in the Inov8 Road X line? Many thanks! I’ll check those out and may also see if K-Swiss has a good option. I bought the Inov8 X-233 and have run about 50 miles in them. Very happy with them. Will replace the Kinvaras with these. Needed 1/2 size smaller (I usually run in 11.0; the X-233 are 10.5). I just bought a pair of Kinvara 2s and ran 8.5 miles in them this a.m. on mostly road and some canal. They felt great. This was my first run in minimalist shoes, from regular shoes, and I did feel it a bit in my feet and legs–like I was using muscles I don’t normally use. Not bad, but different. The big surprise is when I took them off afterwards, both of my big toes had worn through my virtually new Smartwool ultralight socks. In the past, I’ve worn through the toes of the socks only as they’ve worn down all over–heel and ball of the foot also. What’s going on? Is it the shoes? (Is the toebox narrower than the Brooks I was wearing?) Or is it the way my foot is responding to the more minimalist shoe (4 mm heel drop vs. 12 mm for my old shoes)? This is a bit perturbing–am I going to have to sew up my socks every time I wear them?! And–bigger question–if my big toe is curling up more, is it going to go through the toe of the shoe? Any insight would be greatly appreciated. Thanks. Where on the big toe, top or bottom? The top of the toe, presumably at the edge of my toenail (which are trimmed, btw!). It’s funny, because I didn’t feel like my toe was curling up as I ran. It may just be that the inner liner is rough enough that it abraded the sock. The smartwool ultralight socks are quite thin, and the top front half of the sock was “fuzzy” after the run, but the rest of the sock shows little wear. I haven’t found any posts with this problem, and since I’m new to minimalist shoes, I don’t know if this is common or not. Thanks. Have not experienced anything like this, could just be a fit issue. Some people find the Kinvara to be on the narrow side. I hope that’s not the case–I really do like these shoes–but you may be right. I have a narrow foot, but my toe does turn up. Maybe I’ll give them another shot and see what happens. If I have to switch brands, do you have another minimalist shoe you’d recommend that I might try? Thanks for the suggestions and all your help. What about the Merrel Pace Glove, for a zero drop shoe? I see you’ve reviewed the Trail Glove; just wondered how the Pace Glove compares. It’s a women’s shoe, so naturally I can’t speak from personal experience. If you plan to use it on trails, probably similar to Trail Glove, but if roads the Road Glove is coming soon and is great. I like both the Trail and Road Gloves. Thanks–I didn’t realize they named their male/female shoes differently! Sounds like the Road/Dash Glove is what I’m looking for. Too bad I have to wait until next year! Thanks again for all your help. Update: I decided to keep the Kinvaras and have run 3 more times in them, the last a 15-miler yesterday. No sock issues. Glad I gave them another try. Hi, your good posts and review made me try and choose theses shoes : i like them and i feel quite confortable with it. * do you a know a similar shoe which might be a little bit wider ? Sockless is fine as.long as you don’t get blisters. There are a lot of shoes with a wider fit, but most are much firmer. You might try the Saucony Cortana. The Mirage is more similar to the Kinvara than is the Cortana – and it is most definitely wider than the Kinvara. I have run in both the K1 and K2, the noticeable difference for me early on was that the lacing construction on the K2 is a bit higher onto the ankle. I run sockless and this made for a quick blister, but I just took the shoestring out of the top hole and tied off early, this corrected the problem with no issues since. As for all the toe box width issues, I love the slightly narrower toe box!! 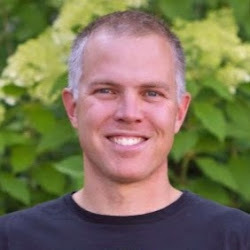 Hi, a few days ago a spoke with Saucony here in the Netherlands, and i asked him what the difference was between the kinvara 1 and the kinvara 2. He told me some things but one thing in special. The Sole width is exactly the same with those 2 shoes. We picked an 1 and a 2 and put it on top of eachother also, and there was no difference in the sole. Did you compared two of the same sizes? I don’t doubt that the sole is the same, it’s just that after a few hundred miles there is noticeable compression and widening of the sole. Not aware of any sizing change. Pete, do you know of anywhere to get a good pair of flat insoles to use in my K2s? I know you’ve said you use the ones from your Nike Free’s, can you buy those alone? Good question – I’ve never looked for flat insoles, always just grab them from other shoes. Sorry I can’t be of more help. I need sneaks with little to no arch. My feet do not like the feel of arches under them, but love cushiony shoes. The front of my foot is also somewhat wide. Saucony ususally works for me, but almost all of them have arches. The best I could find was the Grid Lightspeed. It actually feels more minimalist than the Kinvara 2. Have you tried it? I’m wondoring how the Lightspeed compares to the Nike Free. Is the Nike equally as wide in the toe box and equally as cushy? I’m not familiar with the Lightspeed. You might check out the Newton or Altra shoes if you want something with no arch support. Thanks! Do they run wide like most Saucony? 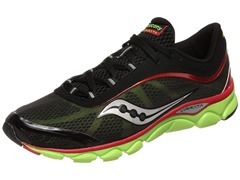 Are you going to do a Kinvara 3 review, now that they are available? Yep, soon. Did my last three runs in them. Improved fit, sole feels pretty similar. I have been experiencing a similar pain, and also on the lateral left knee as the guy in this video mentions. I like the kinvara, but somehow they have never felt quite right, there is something bit off. Cand this guy be right? Sure, some shoes just don’t work for some people. I’ve had specific shoes cause me ITB pain as well, and it has gone away immediately upon switching to another shoe. It’s a matter of finding the best shoe for you I guess.